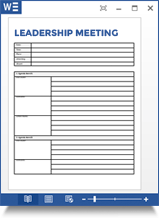 Writing an agenda is essential for any effective meeting! Preparing for a meeting starts with a proper agenda. An agenda is a written plan of topics to be discussed during a meeting. Having a suitable agenda prepared will make the meeting more efficient and help your team to achieve more. Here are some tips to writing an agenda. Start by collecting input from participants about what they think should be on the agenda. Look up prior email correspondence or call participants. Some meeting management systems such as MeetingBooster allow you to write agendas in an environment where participants can submit suggestions electronically. If you are working on a meeting belonging to a series of meetings, it is beneficial to review prior meeting minutes to include parked topics, unresolved issues or for inspiration. Often topics are repetitive for meetings belonging to a series. For brainstorming and getting an overview of topics you would like to include in your agenda, some people like to use mind mapping software such as MindView. Mind mapping allows you to get a visual overview of ideas that you can later export to Word as the agenda. Alternatively, you can brainstorm agenda ideas on paper or start writing notes directly in Word. Once you have gathered information and created an outline of topics, you can start writing the agenda. You can use a normal Word processor or meeting management software such as MeetingBooster. MeetingBooster has an agenda writing module that allows you to easily to enter your topics and the respective time for the topics. Remember to always allocate durations for each topic in longer meetings. Write Your Next Agenda With MeetingBooster!